What’s better than buying a brand-new car for the company? Getting an awesome car wrap made for it! It’s one thing to have a vehicle that makes it easy for you to transport goods and fulfill orders. But, there’s a whole other world of benefits available when you start thinking about cars as marketing tools. All it takes is the right car wrap design to turn an everyday vehicle into a head-turning part of your brand. This allows you to get the attention of new potential customers and stay relevant in the minds of those who have already done business with you. A wrap boosts your brand presence and subtly pushes customers one step closer toward completing their buying cycle. To get the most out of car wrapping, though, you have to know how to make an exceptional design. Here are a few things to keep in mind during the creative process. Since the main point of getting a car wrap is to show off your brand, it only makes sense to begin the design with brand values in mind. Think about what really makes your company stand out. Is it the customer satisfaction you’re able to provide or the fun internal culture you offer employees? Do you have the most innovative products in your market or the most efficient fulfillment process? 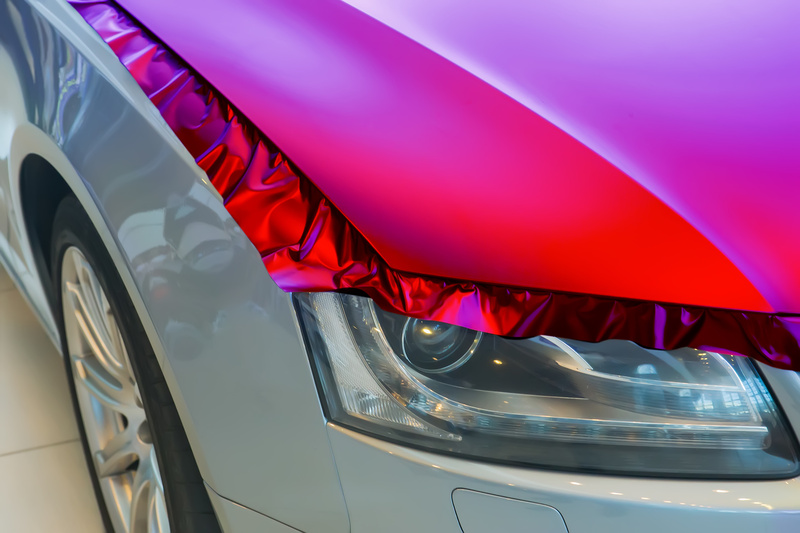 These are just a few of the things your car wrap can highlight. Let such qualities set the foundation for your creative process, then start putting the visuals together with your logo and brand colors as focal points of the wrap. As important as brand values are, they can’t just be written all over the car wrap. They have to felt. This is why it’s crucial for you to use brand colors and find a smart logo placement on all sides of the vehicle. You can put the company name or your contact information on the car wrap’s design, but you don’t need to write all over the car. Actually, this is one of the worst things you can do! Too much writing confuses users. It makes them have to figure out who you are and what you do instead of giving them a visual to have as a reference. Keep in mind most people will only see your car wrap in passing on the road. They only have a few seconds to look at your car and understand what you’re trying to say. Say it with visual effects rather than too many words. Speaking of seeing your car on the road, remember to use a vehicle template. It’s much different to create a vehicle wrap for a Volkswagen Bug than it is to wrap an entire pickup truck. As such, you need the correct template to make sure everything fits just right. You want the wrap to be proportional all the way around, which means all the details need to look as you’re imagining them to. The last thing you want is to put a car wrap on a vehicle only to find your logo is squished or the words aren’t big enough. When you use a vehicle template, this is almost guaranteed not to happen. Maybe you already have a wrap for your company SUV and you need one for the new delivery van that was purchased. Maybe you have to upgrade the current car wrap you have for something better. Either way, always design with the actual vehicle in mind. Another thing to remember is that there’s a fine line between turning heads for all the right reasons and because you’ve gone over the top. Even with something as bold as a car wrap, less sometimes really is more. Take a step back for a second and look at the design. Break it apart. Ask yourself if this is something that would interest you as a consumer or if you’d be able to remember the car wrap if passed on the highway. If you feel like something’s not right or it’s not easy to grasp the concept of the design within a few seconds, you have some edits to do. You can also consider partial vehicle wraps like these wraps instead of full ones. Be prepared to go through multiple rounds of edits until you get the perfect design. If you don’t, you risk coming up with an average car wrap at best. You deserve better for all the time and money it takes to design any car wrap. If you’re going to do this, do it right. Take the time to edit every single detail of the design no matter how big or small it seems. This goes for playing with how all the colors work together to finding the ideal font size for your contact information. Edits may also include changing how strong the gradients are or turning shapes on different angles until you find what works. Maybe even work on two or three design ideas and present them to your team members for feedback. Having options to consider could mean you end up creating one amazing design using different elements from each of the car wrap concepts you started with. It might sound like more than you signed up for, but once the final car wrap design is complete, you’ll realize the work was worth it. Do all the edits it takes until you reach that “aha!” moment – until there are no more edits needed and the design looks absolutely perfect. Although there’s quite a bit of work that goes into designing a car wrap, it’s all for good reason. The more you keep the brand at the heart of the design and play with all the ideas in your head, the better the final result will be. This is especially true if you remember to use a vehicle template and err on the side of simplicity over flashiness. But, you won’t come up with anything just by reading about wrap design! You have to take these design tips and create something spectacular. Click here for a little more inspiration to help you.